Allias Stahl leads off the sprint medley relay at Perry's Davis Relays March 28. SAYDEL — The Panorama boys track team was in action Thursday at Saydel after competing Tuesday in the Earlham Coed Relays. Boys team points from both meets were not provided. The only event placing for the Panthers Thursday was Gracen Welberg’s victory in the high jump, which came when the senior cleared six feet. Logan Hutchins had a distance of 16 feet, 3-3/4 inches in the long jump, with Koltin Sloss pushing the shot put 39’5 and spinning the discus 116’3. Huchins ran the 400 hurdles in 1 minute, 5.94 seconds, with Spencer Hunt running the 100 in 11.83 and the 200 in 24.35 with Kade Kemble crossing in 2:29.85 in the 800. Kevin Cogil competed in the 1600 (5:17.44) and Paul Hansen the 3200 (14:51.48) with Levi Richey, Luke South, Hutchins and Welberg completing the shuttle hurdle in 1:07.36. Stahl, Richey, Jadyn Howard and Dominic Walker ran the sprint medley in 1:50.07, Hutchins, Howard, Cogil and Avery Norman the distance medley in 4:38.43 and South, Hunt, Welberg and Stahl the 4×100 in 46.45 while Walker, Howard, Declan McCarthy and Kyle McClatchey the 4×200 in 1:51.36. Welberg also won Tuesday’s high jump, clearing the bar in Earlham at six feet even, with Sloss placing third, at 128 feet, in the discus. Sloss threw the shot put 38;5, with Hutchins landing at 15’9-1/2 in the long jump. South and Welberg were 4-5 in the 400 hurdles in 1:02.4 and 1:03.73, with South sixth, in 17.82, in the 100 hurdles while Howard, Hutchins, McClatchey and Richey placed eighth in the shuttle hurdle in 1:20.61. Dillon Bennett competed in the 100 (13.76), Howard the 200 (29.03) and Walker 400 (7th in 58.96), with Hansen running the 800 (2:55.38), Norman the 1600 (5:55.07) and Hansen the 3200 (14:36). Stahl, Hutching, McCarthy and Bennett teamed for the 4×100 (51.92), Stahl, Hutchins, Kemble and Peyton Prince the 4×200 (7th in 1:43.34) and Richey, Walker, Kemble and McCarthy the 4×400 (4:10.2). The distance medley quartet of Stahl, South, Welberg and Cogil placed fourth in 4:02.31, with Stahl, Welberg, South and Walker competing in the sprint medley (1:45.96) while Norman, Richey, Cogil and Kemble formed the 4×800 (9:46.76) unit. 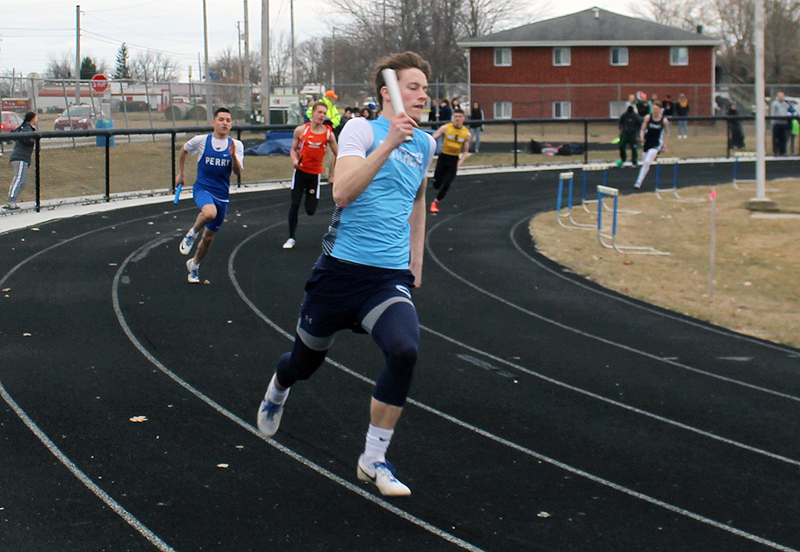 Panorama will compete once next week, with a visit to the Van Meter coed slated for Monday. They will then participate in coed events at Audubon April 23 and AC/GC April 25.